Support Tierney and Hundreds of Kids Impacted by Cancer! When you make a contribution to Cancer Support Community Arizona, you benefit from an Arizona dollar-for-dollar tax credit, so that no one faces cancer alone®. Making a gift to Cancer Support Community Arizona is as easy as 1-2-3! Donations made to CSCAZ reduce your direct state tax liability by up to $800 per couple or $400 per individual through a direct tax credit. Online at CSCAZ.org or by mail to Cancer Support Community Arizona, 360 E Palm Lane, Phoenix, AZ 85004. This credit is in addition to those you can receive for private school tuition and public school extra-curricular activities. You don’t need to itemize your deductions to benefit from the credit! When Tierney was 6-yeas-old, he had a golfball-sized tumor removed from his pituitary gland. Although the surgery was a success, it left him with long term medical issues including diabetes insipidus, hypothyroidism, adrenal insufficiency and hypothalamic obesity. Fortunately, Tierney and his family — mother, father, 2 brothers and grandparents — found support at Cancer Support Community Arizona. Now, 12-years old, Tierney has the confidence to attend programs alone. He attends our youth (ages 5–12), and teen (ages 13–21) programs which give him independence and opportunities to connect with other children his age impacted by cancer. 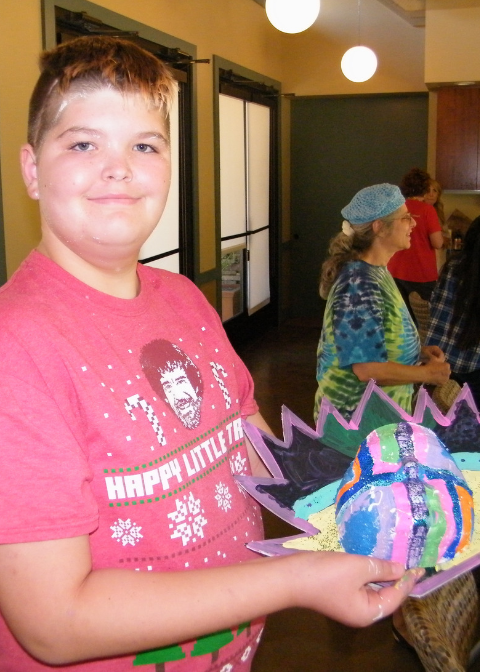 Some of Tierney’s favorite events are from our expressive arts programs. When asked what he likes most about those classes, he said “It’s not ‘You must do it this way’ or ‘don’t do it that way!’ It’s my imagination. It can never be wrong”.